First off, if you'd like to read about weddings and saving yourself a little cash, head over to Daisy's blog at The Story of Daisy Girl to see my guest post on how to have a gorgeous wedding within your budget (it's based on my own wedding from May 2011). Hope you like it! What are your plans this weekend? We're going to be packing up and taking a short weekend trip back to Abilene to celebrate one of high school friend's wedding, and we're excited! Love must be in the air! Speaking of love and marriage, this video (found again via Julia's blog) encapsulates the true essence of love, in my opinion. I cried the first time I saw it...and the second...and of course, the third time when I had my husband watch it with me once he got home. I was blubbering on the side, but he admitted to me that he got that frog in the throat feeling, so there! Love means stuff to men, too. With that said, have a lovely weekend, friends! 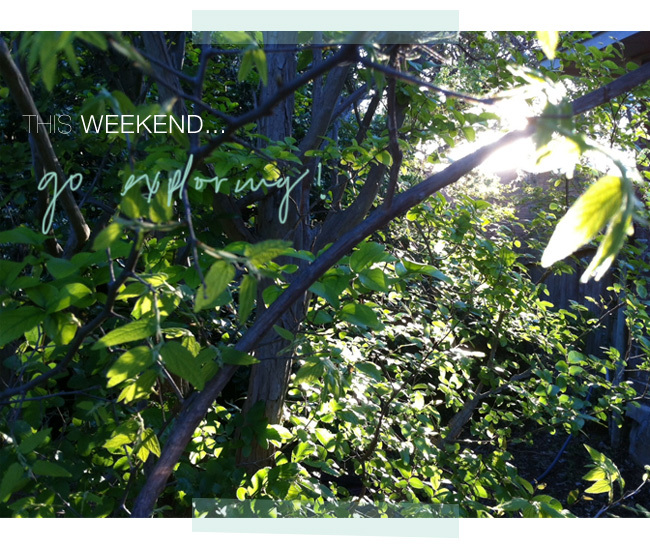 Go exploring, won't you? im not doing much this weekend! im actually thinking about laying by the pool all day since it's hot over here in carolina! THANK YOU THANK YOU THANK YOU for your swwet and lovely comments!!! I watch the video and I started cry me too!!! thank you for recomend it to me!!! HAve a nice and happy weekend!!! your guestpost and the photos were beautiful and i loved your ideas! after reading it now i really think its not only worth it money-wise to do flowers/centerpieces/ etc on your own but it truly adds an unique touch to the wedding ! have a great weekend ! This is so lovely! Thanks for sharing the video and I hope you had an amazing time! Amy: How exciting to get them in! I squealed when it got my CD in the mail. Bah, hope that studying didn't drain you! Beina: Of course, love! I thought you may like it since you've been with your boyfriend for such a long time and seem so happy together. :) Hope you had a wonderful weekend too! Julia: Thank you so much! That was such a monstrous post, and thanks for wading through it all. :) It really did add to the special remembrance. I think most of my friends couldn't get over my mom's egg rolls, though! She accidentally stole the show with her cooking! Hannah: It was fantastic! Hope you had a great weekend too! Ana; Thank you! I just had to share it...it is too sweet. It was such a good trip, thank you. Hope you had a great weekend with Emma!